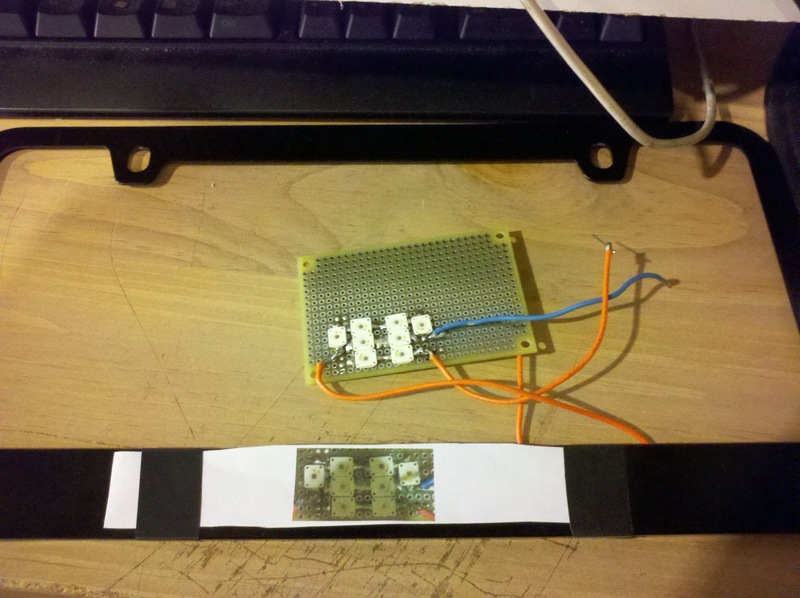 This project is an attempt to build night vision goggles for next to nothing. A little nuts, but I'm here to have fun! I've been experimenting a lot lately with IR LEDs and found that I can get a lot of intensity out of them. This could be used for creating some home brew night vision goggle solutions. They do sell commercial IR illuminators for night vision, so this isn't an entirely new idea. They come for a variety of prices. Search for "IR illuminators", here are some examples. But the LED diodes are not expensive. They sell ones with very wide and very narrow illumination patterns. Here are some I bought recently from Digikey. 10 for $3-$5. 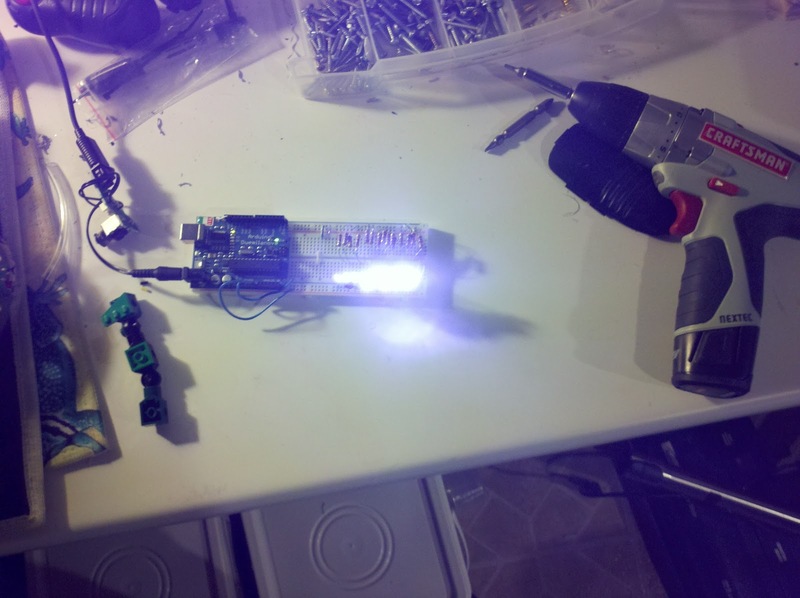 Or you could build an illuminator by modifying an LED flashlight, I'm sure you already have a dozen around the house. This one has a nice housing, a lens, and supports a cluster of LEDs. And use a camera and display from your pile of used cell phones (I hope everyone has such a pile). An older one with a smaller display would be best. Now the crazy part is mounting the cell phone in a headset and sealing up the light output to your eye. A pair of drugstore magnifying glasses will allow you to put the display close to your eye. I happen to have one of these phones that is out of service when I got a smartphone. I has a 3Mpixel camera and a built in display on the other side. 95% of the vision system i need. Although the old clamshell phones would work too. Maybe better because the display is smaller. I've got some of these too so I'll see what works best. This project is underway... so the post will build as I complete it. My town installed two red light cameras and a speed camera in a 1/2 mile stretch into my neighborhood. They lowered the speed limit too. The week they put up the speed camera I got three tickets for going 42mph and 43mph in a 30mph zone. That made me all warm and toasty inside. 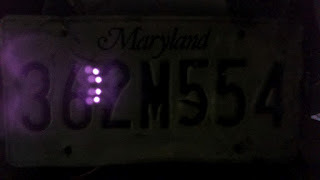 So I thought I'd play with technology to spoil the photos of license plates and share the fun with the world. Can't jam the radar but I could theoretically make it harder to get a photo of my plate. They want to have really clean photos to stand up in court. OK - so this is totally for fun and i'm not advocating anyone to break any laws or even bend them. Whatever you do is totally up to you, I bear no responsibility. If this is illegal where you live, I encourage you not to try it. This is a playground for technology and not anything else. Reading further in this blog is acceptance of the fact we are all responsible for our own actions. for IR remotes, etc. Invisible to the eye but visible to silicon digital camera sensors. Visible light is is 390-750nm. 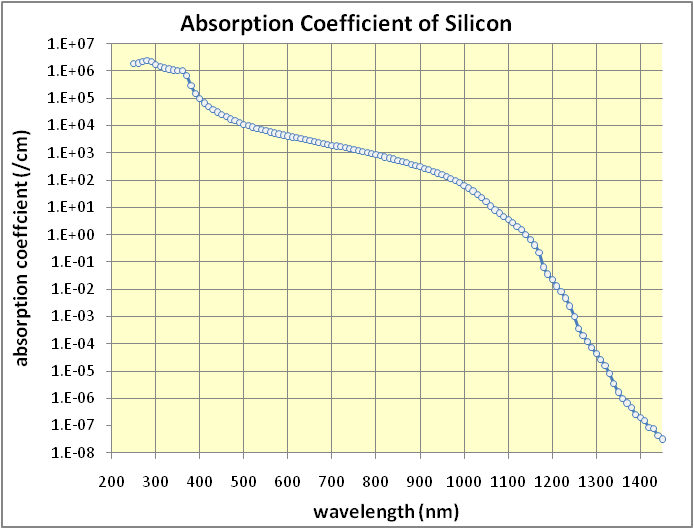 Silicon is used as sensors, and silicon absorbs these wavelengths. and very expensive, they require many precisely controlled layers of deposition. These are also used as invisible illuminators for security cameras, so we know cameras see them. First I will leave them illuminated all the time, rather than try to catch the flash with a photocell some other nonsense. 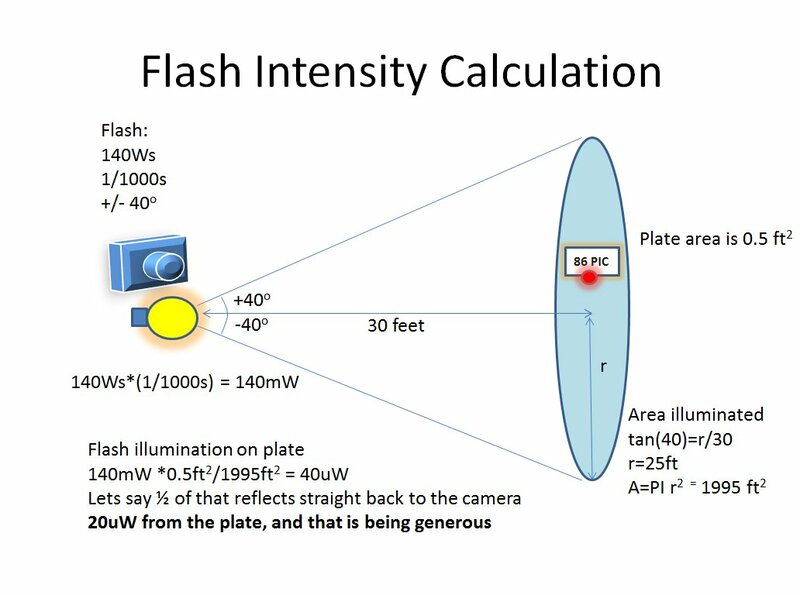 That is how photographer's flash extenders work, they sense the flash and make another flash fast enough that the shutter is still open, but the sensor is a lot closer and things are much more controlled than the outside environment. Speed cameras must have a pretty fast shutter speed (I calculated this below) too. The reaction time would be short, the flash hard to detect. Tried them and they are OK, but it didn't have the same "stickin' it to the man" appeal. Since IR is invisible, this should be legal. 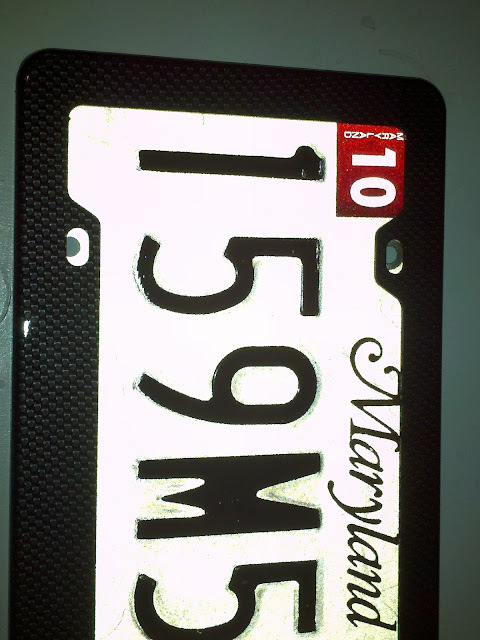 I can't cover the plate, license plate covers are illegal in my state. 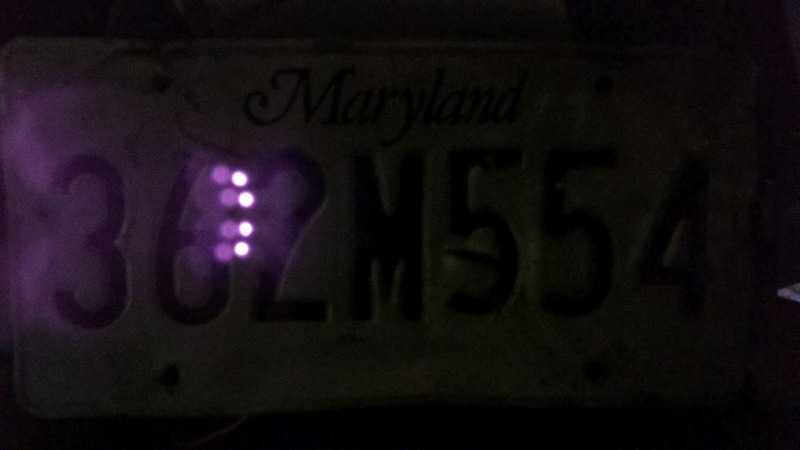 The IR LEDs must be on the edge of the plate, close enough that some of the numbers can't be photographed due to the "bloom". Just a little glare to make it hard to read and the ticket will be blocked. what the heck I'll try it anyway. I'm a bit unsure that the lights will be bright enough and this may all be a boondoggle. wouldn't be any higher. So I might as well run them off DC to maximze intensity. to photography. I will have to experiment with what works best. of moving cars from far away. That's why they need a flash, they need all the light they can get. I'm guessing they need exposure times of 1/250 to 1/1000 to capture the moving car. photo was taken. 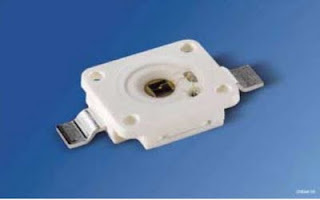 IR LEDs are designed to modulate at 30-40kHz for remote control. in the response time of the LEDs. power with reasonable field of view, and of course, low cost!! I already had 10 IR SFH415 U diodes from the IR sleeper and TV bgone projects. I also bought these others from digikey, all were less than 50 cents apiece. have bought all 850nm, but I thought a mix for experimented would be best to start. As you can see, they didn't break the bank! So far I've spend <$20. The traffic tickets were $40 each. Here is a sample of what they do to a digital camera when illuminated! I can't show you what they look like to my eye, but they look dark and off. 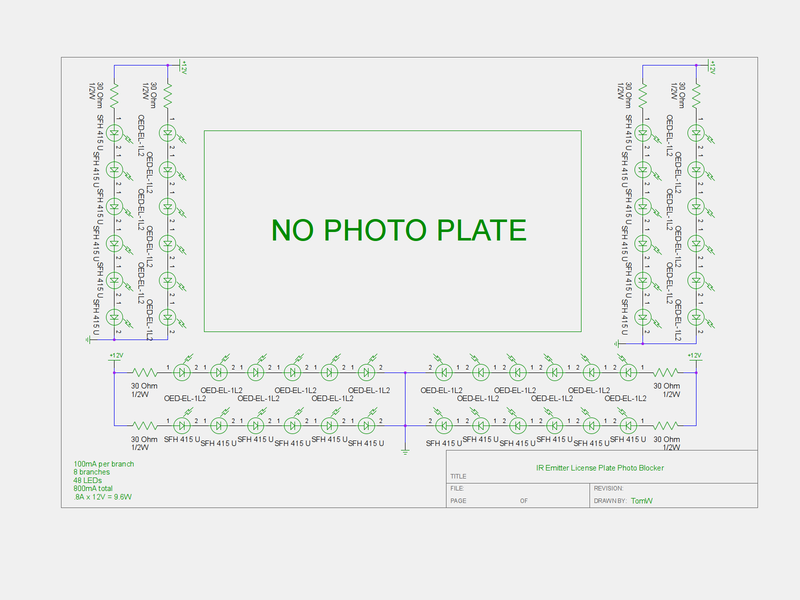 I'm going to experiment with illumination, photos and placement when the parts come. which should have had a wavelength advantage, wasn't appreciably brighter. a little more obvious but seem to be the best. 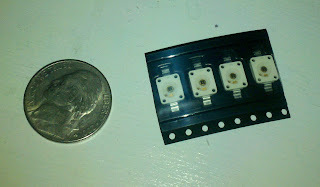 In this photo the LEDs are in order left to right, SFH 4556, SFH 415 U, OED-EL-1L2, SFH 415 U.
times the absorption by the camera. It's visible glow is probably going to kill the use of this one. 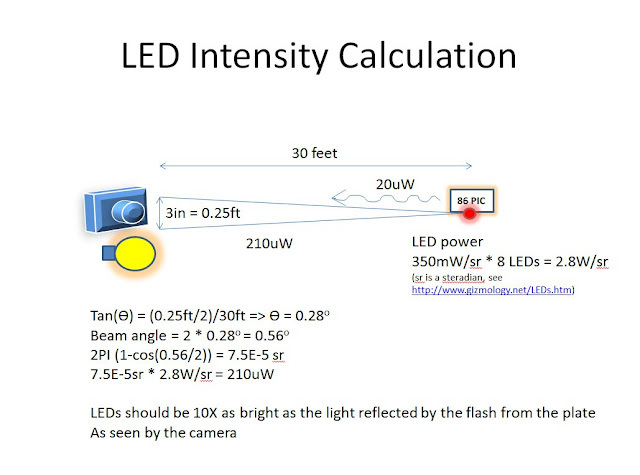 That means that I want to shoot for 150mW to put the LEDs at their max light output. takin with 100ohms, so I will be twice as bright as that. as the gate draws no current. Everyone should buy a bag of these, for 0.17 for 100. 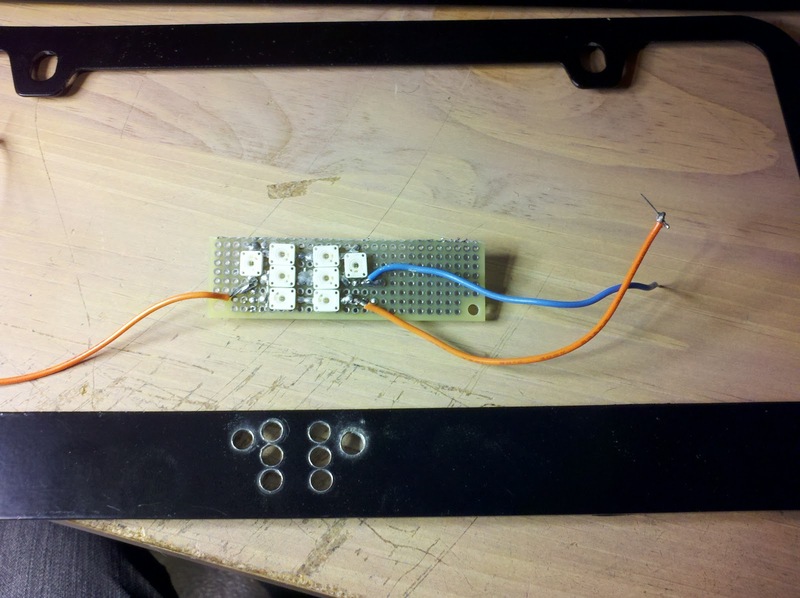 To avoid a series resistor, I could drive the LED with a low duty cycle high current pulse. The 2N7000 has a Rds(on) of about 2 ohms at 0.5A. 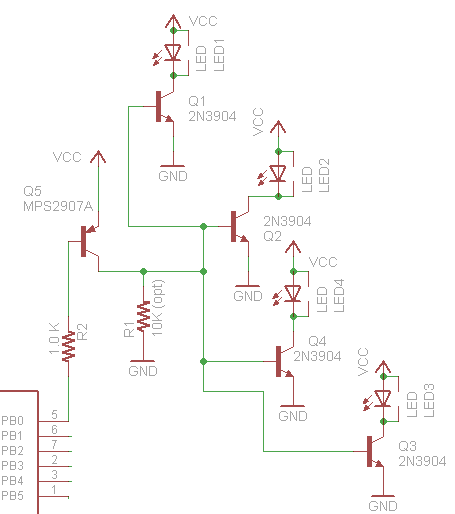 LEDs may have slightly different forward voltages, and will not share the current equally. But best I can do. 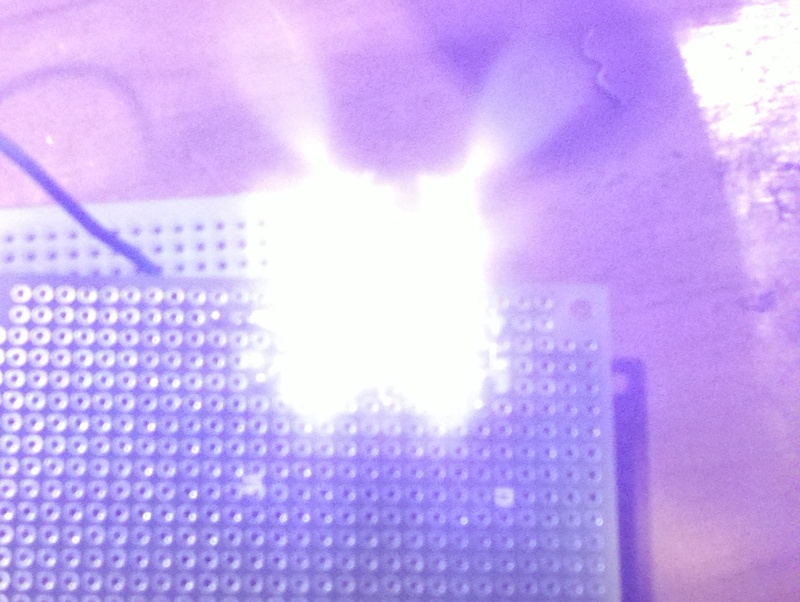 Now I have to keep the LEDs from dissipating more than 150mW on average. 0.875A * 1.5V = 1.31 W peak. 150mW/1.31W =11.5% duty cycle. 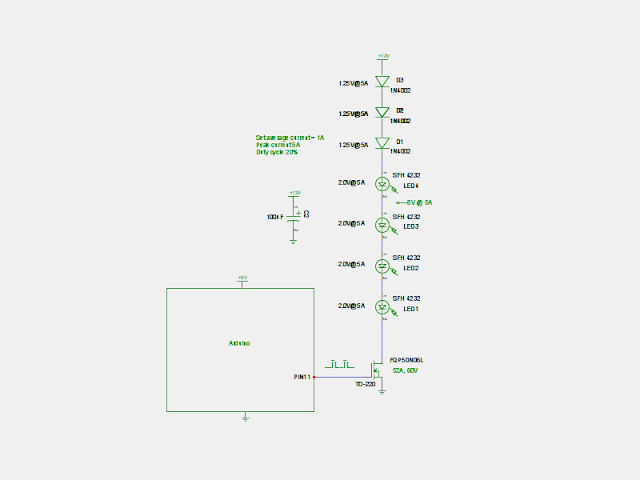 SoI could flash LEDs at 10kHz, with 11.5% duty cycle, two LEDs per 2N7000 transistor, no series resistors. 5V supply. 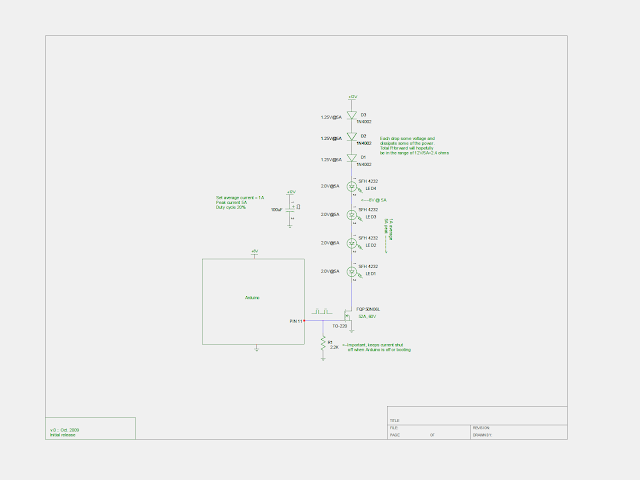 To save components, I could bring the duty cycle up to 50%, and load on more LEDs in parallel. 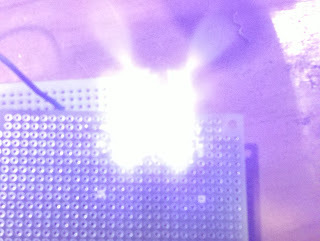 I could put 10 LEDs on at 50% duty cycle, 0.50 * 1.75A * 1.5V / 10 = 131mW per LED. I'm in trouble on the 2N7000s. they only want 1.4A peak current, and I'm doing 1.75A. LEDs don't at all. I think I will switch out the 2N7000 with a FQP50N06L monster. These cost a over a buck a piece but they are 50A rated. out the window and i need to introduce a 2 ohm resistor. Arrgh. 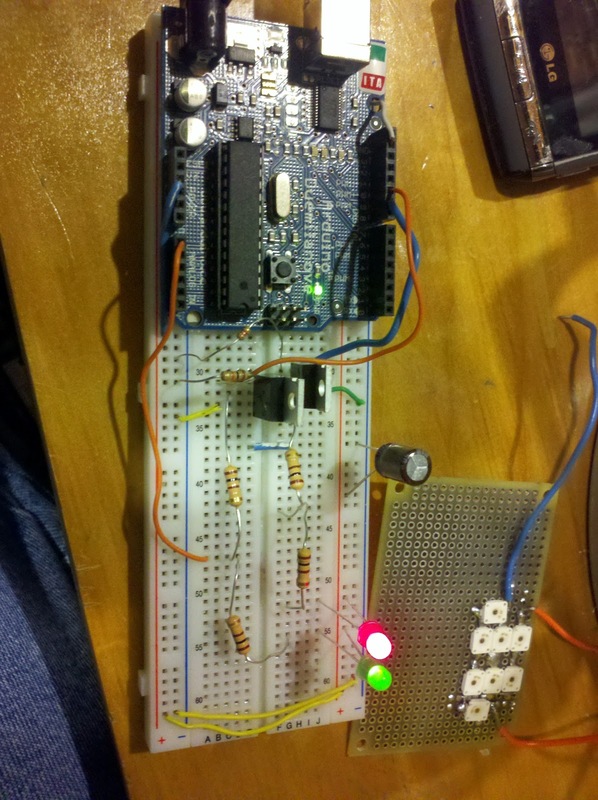 require an oscillator, switching transistor, etc. brighter to the camera. OK. DC wins for complexity and effectiveness. The lower 5 LEDs are the DC, the upper 5 are switched at 10KHz. 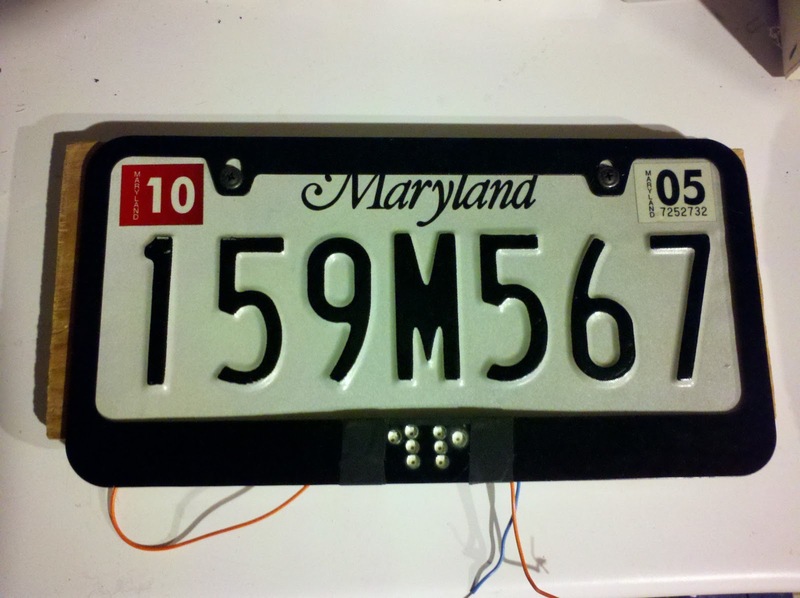 scale test before building up the license plate final version, and got a surprise. While this was on, it started to smell hot. 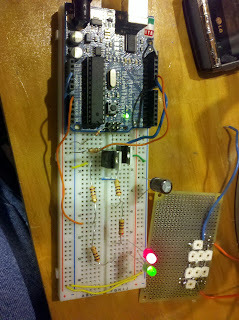 The resistors were getting really warm. Doh! 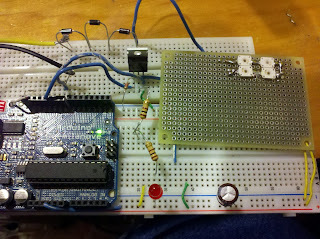 I have 1/2W 100 ohm resistors, so that I put (12V-1.5V)/100ohms=105mA through the LEDs, their max rating. 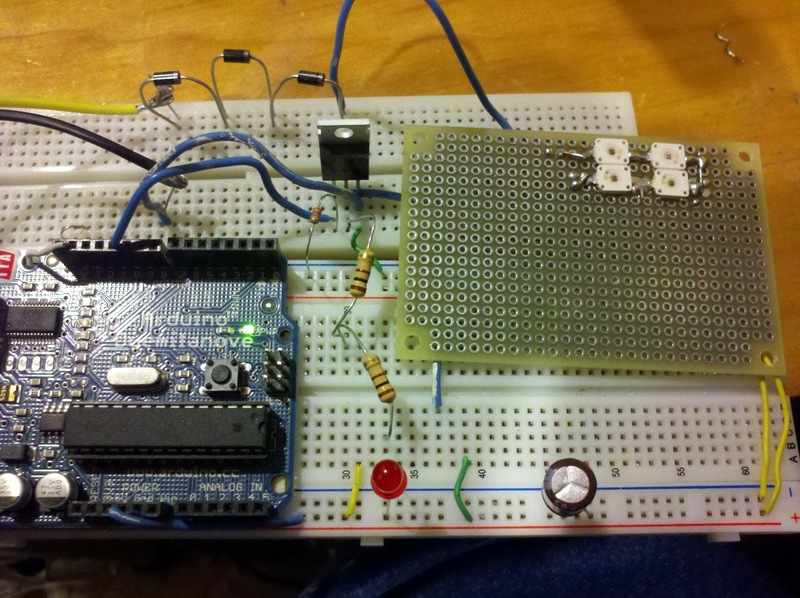 However since I'm running from the 12V auto supply directly, that puts 10.5V * 1.5mA = 1.1W through the resistors. 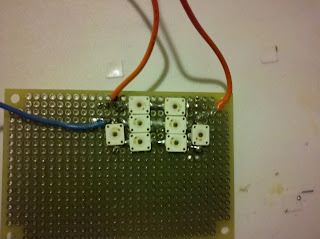 Before I had been running off 5V during tests and the resistors did not get so hot. This simpleton project is becoming more complicated because I'm trying to make a cheap solution. and generally be more efficient, fewer components, all good. 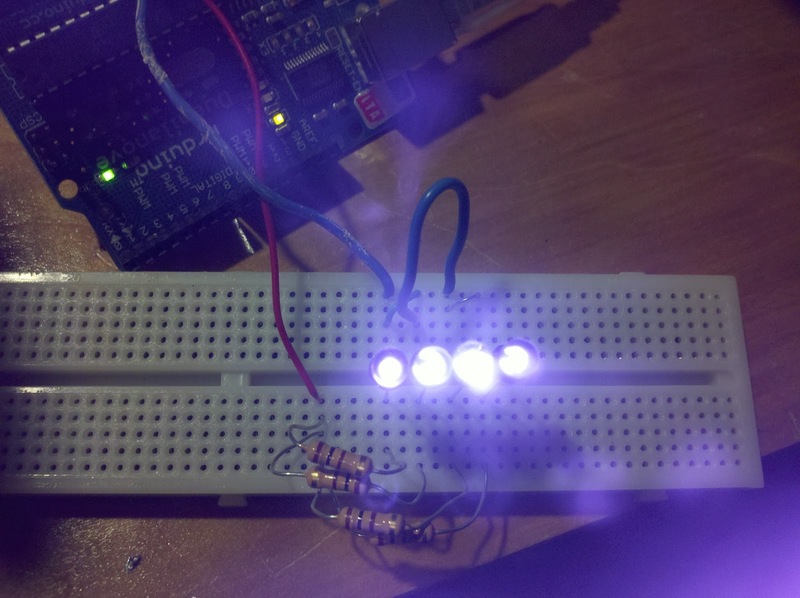 6 LEDs in series like christmas lights, 6*1.5V=9V. 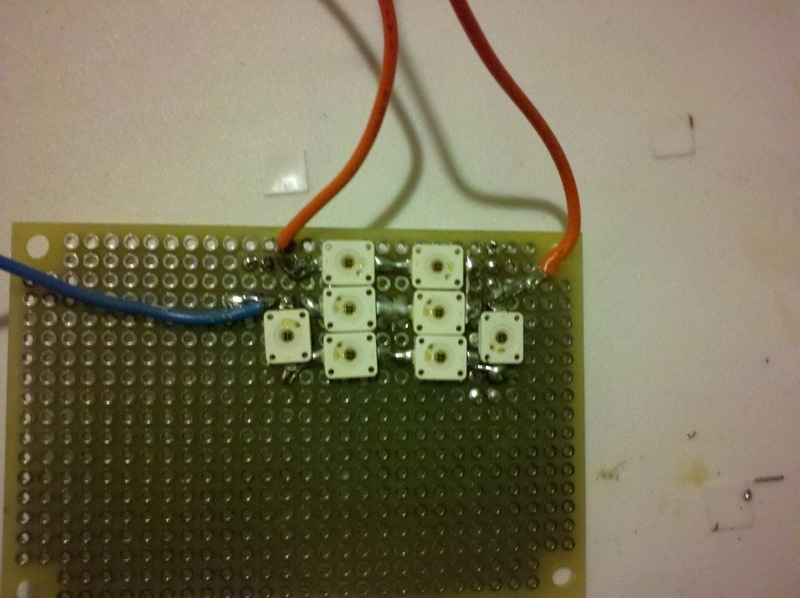 12-9V=3V across the resistor. be able to squeeze in a 7th LED. 3V/100mA= 30 ohm series resistor. Tested out strings of 6 LEDs in series with 30 ohms. Gets nice and bright, doesn't get hot, doesn't waste power. 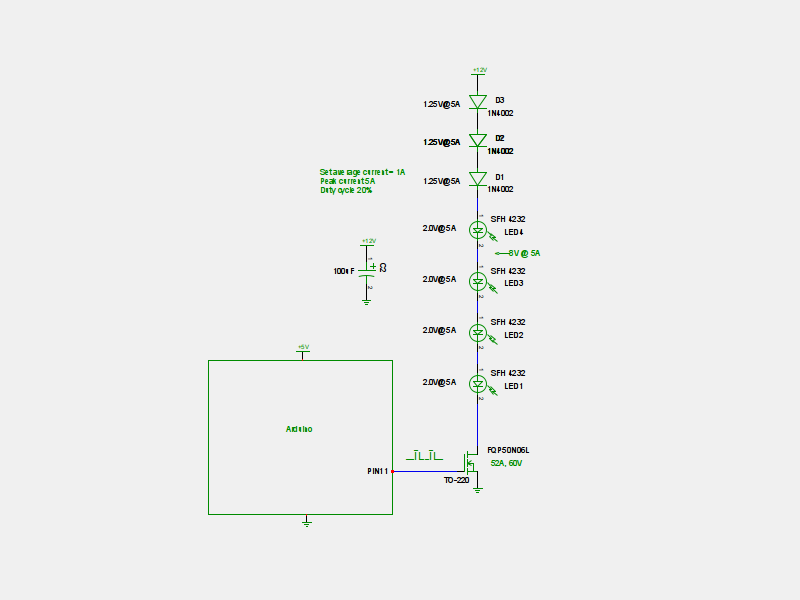 OK, here is the complete circuit drawn up. Strings of 6 LEDs will be used. 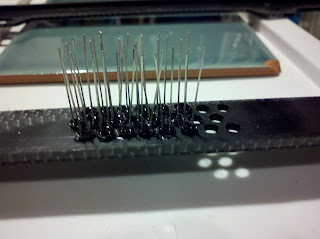 I think I can pack the LEDs in and solder them into chains. So the big structure at the bottom will look like two rows of alternating staggered LEDs with no interruption in the middle for the ground. There will be a tight cluster in the bottom center of the plate, and a smaller cluster at each side which is nice and close to the numbers. Drilled a hole in the license plate frame as a test (see link above) and it drilled pretty well, nice clean hole. The challenge is going to be making nice neat regularly spaced holes or the whole thing will look amateur. I put one of the clear IR LEDs that won the brightness test, but it looks really obvious in the frame. 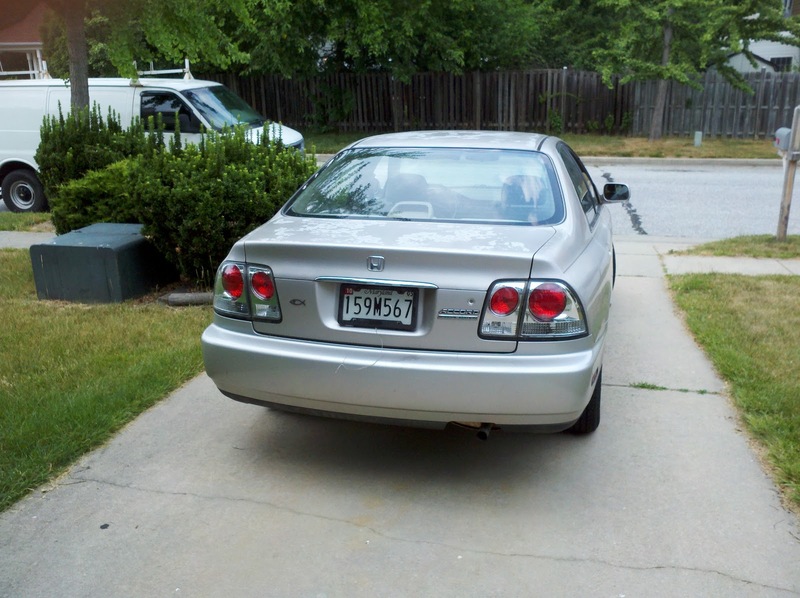 Maybe somebody with a tricked out car might not care, but it really looks like a light, even when it is off. The solid color SFH 415 U look far better and less suspicious. I'm going to have to use those, i'd never have the nerve to put the others on the car. Forget the nice shiny OED-EL-1l2s. Obvious Clear LED (shown off, which is how it looks to the eye). I thought the pattern would hide it. 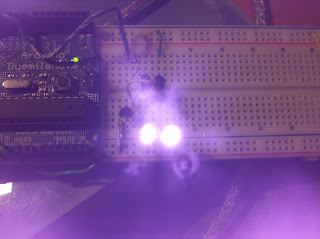 Nearly invisible black IR LED. It is a bump of course and the picture isn't great. But you get the point. 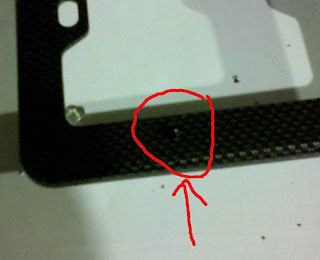 I was planning to use my CNC machine that I've been writing about to drill the holes. Sorry if not everyone who reads these happens to have one. However the CNC machine stage is small enough I'd have to do the job in three passes, and I got impatient with the setup and just did it on the drill press. I clamped a bar to the press stage to make all the holes even distance from the edge of the frame, but freehanded the spacing. I was eager to move this project along and get to some outside trials. 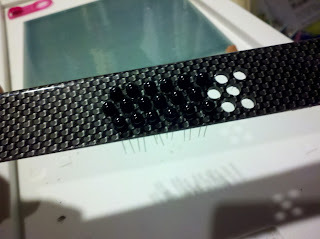 I did OK but not great in spacing the holes and kinda goofed on getting the placement of the arrays even on both sides. No harm done but a production version would have to be neater. 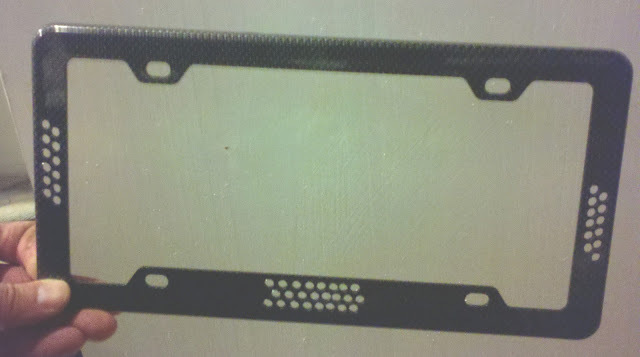 The plastic license plate frame drilled nicely though, it was a good choice for the project. 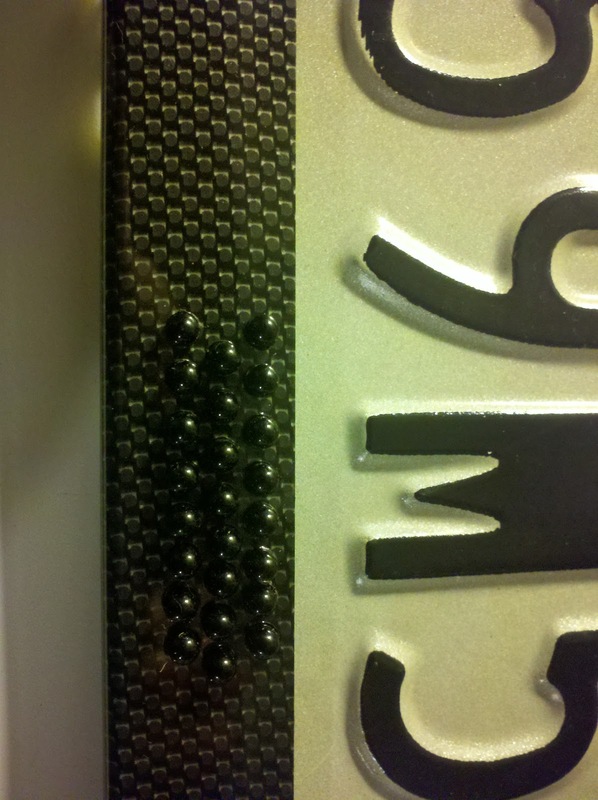 Here is a picture of the holes I drilled. 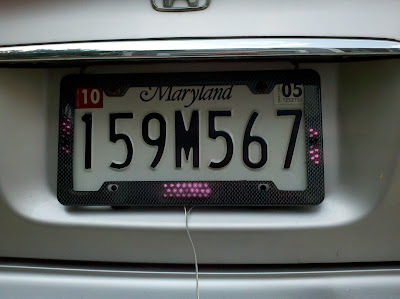 I put the LEDs in clusters to make hot spots in the photo, rather than in a whole line around the plate. The thought is that unevenness and tight hot spots will be best to ruin the photo. Next to glue in the LEDs and wire them up! 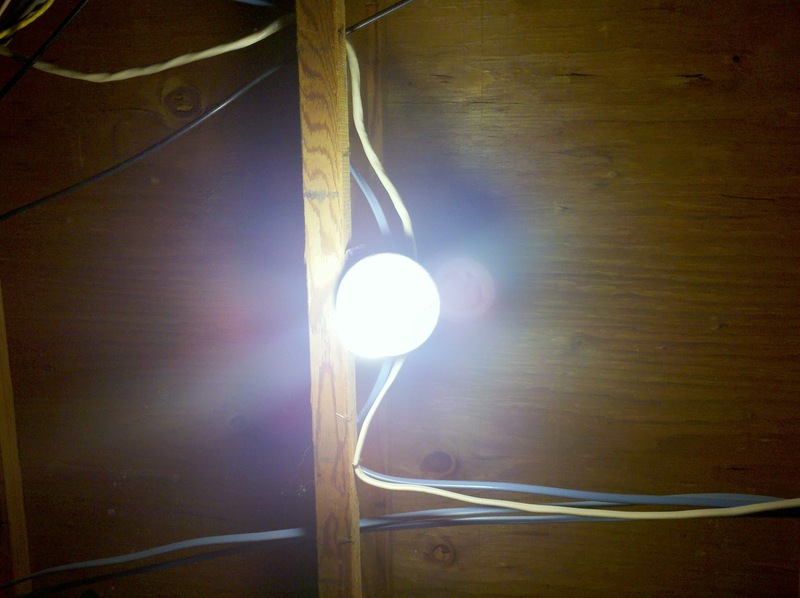 A note about LEDs since a few non EEs seem to be reading this post. LEDs aren't light bulbs. 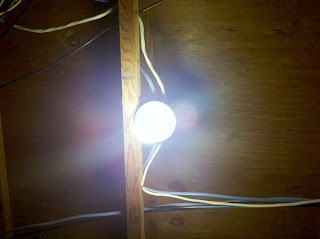 They have a polarity and must be hooked up the right way or they don't light up. This is how you tell which way to put them in. Note that not ever LED follows the long lead convention, but the flat side is a reliable indicator of polarity. Here is a shot of the LEDs getting glued into the main phaser bank in the middle. 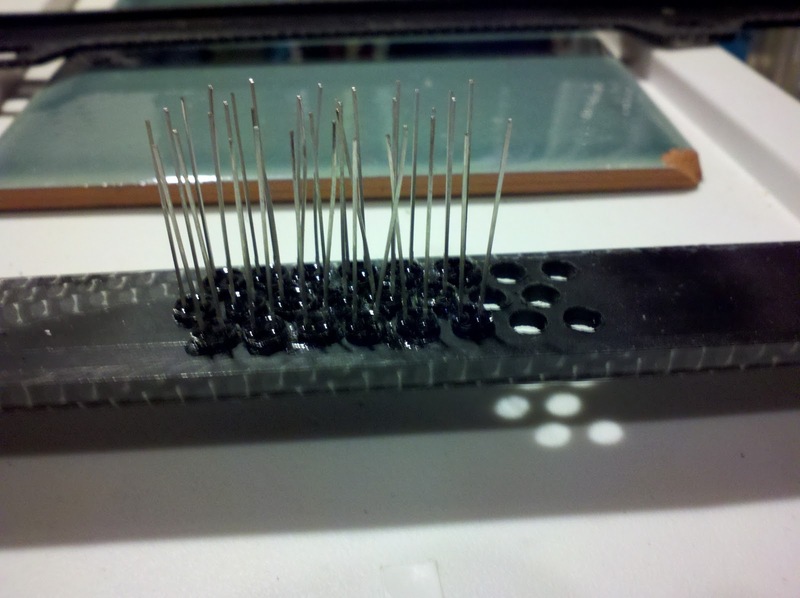 Remember that they are in strings of six, so the pattern of anode and cathode is important to be able to easily solder them into strings. I will show the pattern later. This is about the best I've been able to capture the look of the LEDs in the frame. They are hard to see. 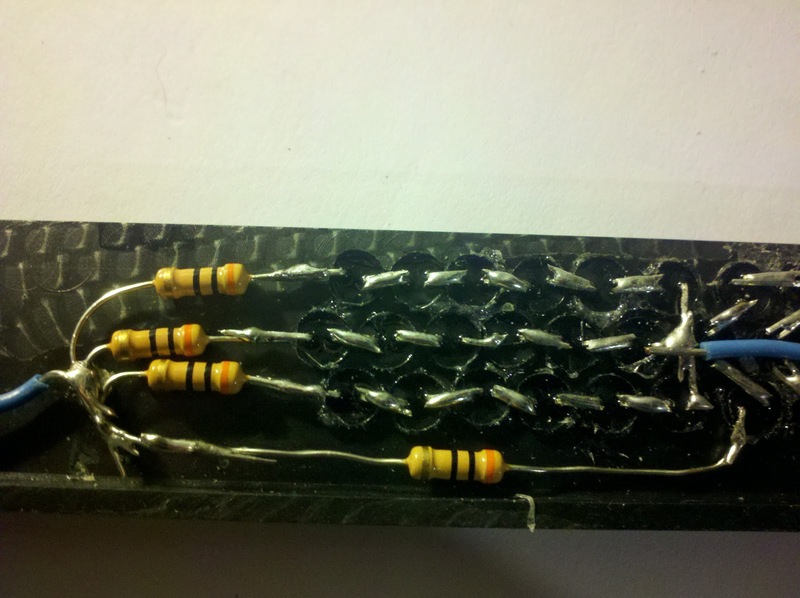 Daisy chained LEDs soldered up to 30 ohm resistors. 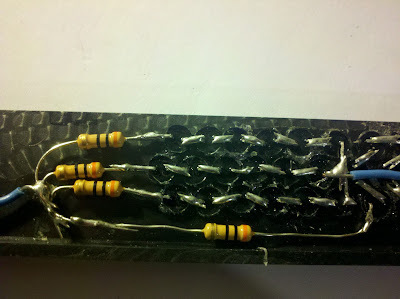 Glued in the LEDs and bent the leads and soldered them together into chains of six. Make sure to keep the polarity correct in the chains. A little messy but this is a prototype. So a lot depends on the lighting. Taking a photo of a moving car and reading the license plate is not easy. A speed camera needs a lot of light, a high speed lens, a short exposure time. So it shouldn't take much to spoil the photo. This photo was taken with indoor lighting and no flash. The picture is very messed up, lots of glare but all in all you can still read the plate if you try. It might not meet the standard of quality to hold up to get you a ticket though. Of course you don't want to mess up the photo just enough to have them wonder what you are up to. You can read my plate here, but eagle eyes will reveal this is just an old expired plate I'm using as a photo model. I went out on a fairly sunny day and put it on the car. Stylin' huh? All in all I succeeded in making something that is not going to draw any attention under normal circumstances. 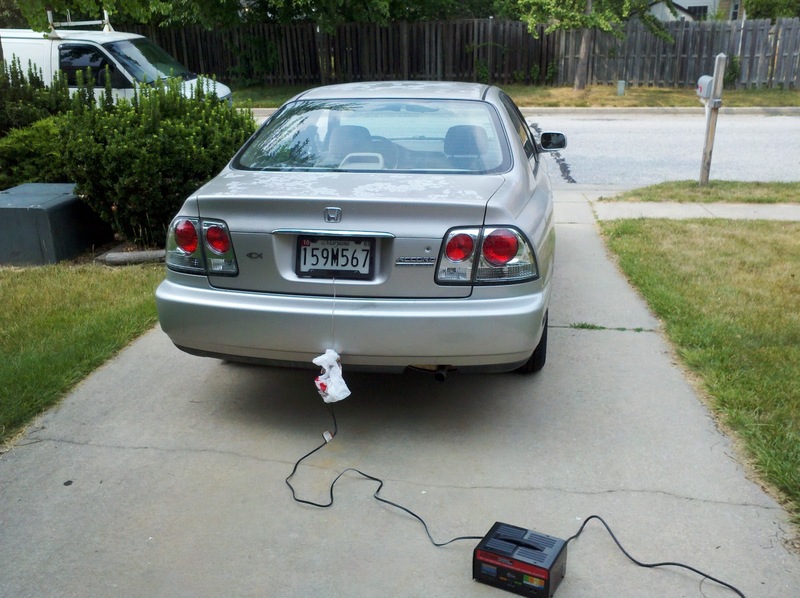 Powered it up with a battery charger to start. This later proved to be a slight issue. 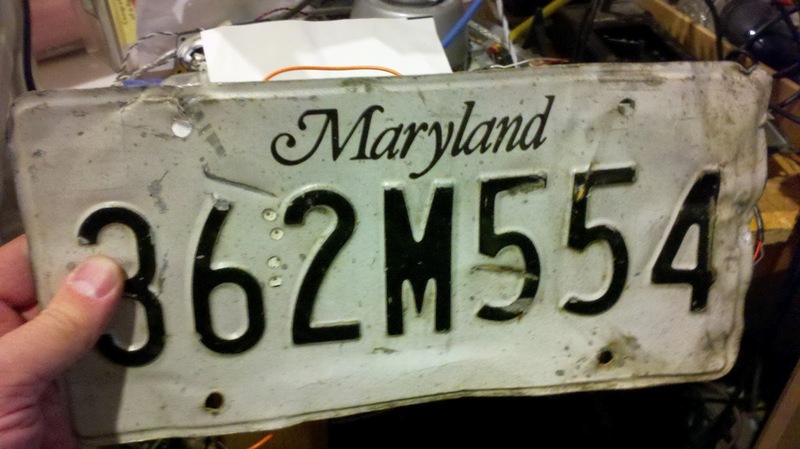 Can you read the plate? I can. Is it even on?? It was so bright outside I couldn't see the display on my camera. This is a tough test. It was bright and sunny. The car was not moving of course, but I also didn't have a professional camera. if you see below, it might be better than this photo showed because of the power supply I was using. Here is a closeup like what you get in the mail when you run a camera. Still looks like a FAIL. 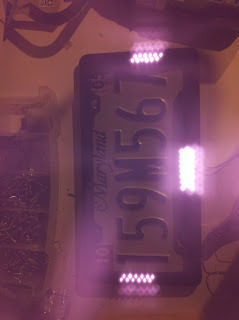 The LEDs are pretty but noneffective under these lighting conditions. Notice something strange happened, which may have reduced the brightness. 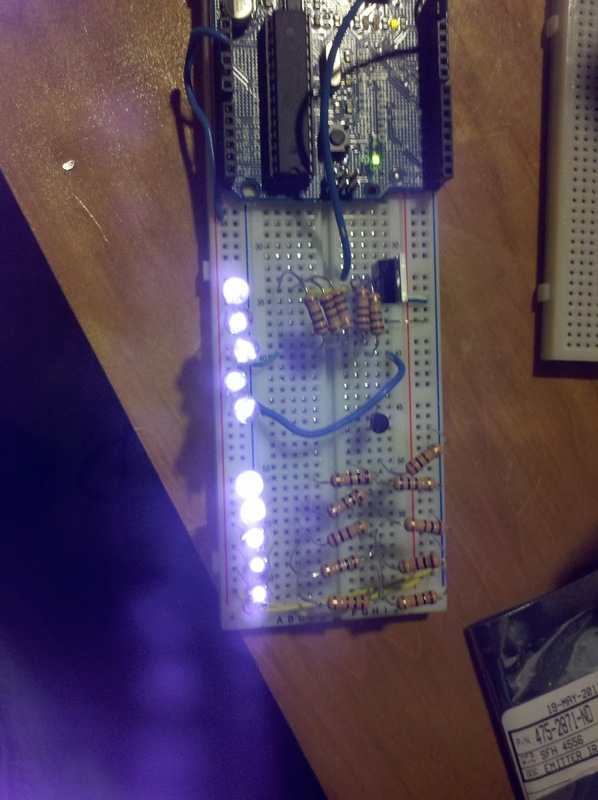 The LEDs were powered from a battery charger in this picture, and it has a lousy AC to DC rectifier that is probably flashing the lights at 60Hz. When there is this much light, the camera is taking an exposure shorter than the time it takes to read out the camera's photo array (I told you I used to design IR digital cameras for a living, trust me). As a result the picture changes while it is being taken, and the 60Hz is not integrated and the LEDs appear to be on in different patterns every time you take a photo. That won't happen with the car's DC power, so it might be twice this bright when hooked into the car power. 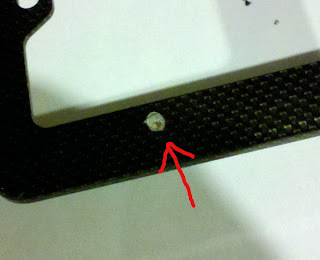 That is why it looks like some of the LEDs are not working. But anyhow there is zero glare. So here is my conclusion for now. There is hope that this would work when it's dark, rainy, or otherwise non ideal for photo taking. On a sunny day, drive slowly. 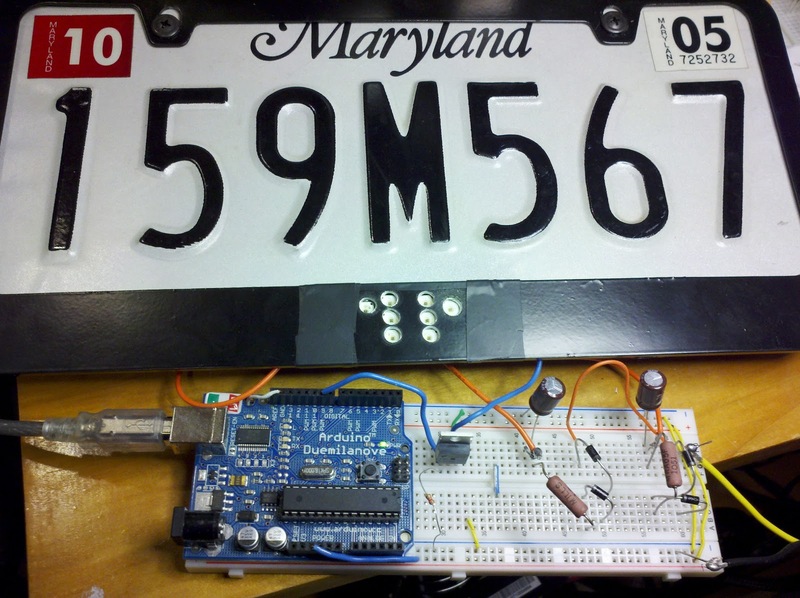 Or make the LEDs spell out a message like "I love the police". I'm not going to go out and run a camera on purpose, so there is no way to know if this is going to work even on a dark night. What went wrong? I had the design parameters turned too far for innocuous, stylish and low cost. I need to redo the project and focus on brightness and high power and see if I achieve something that works first. 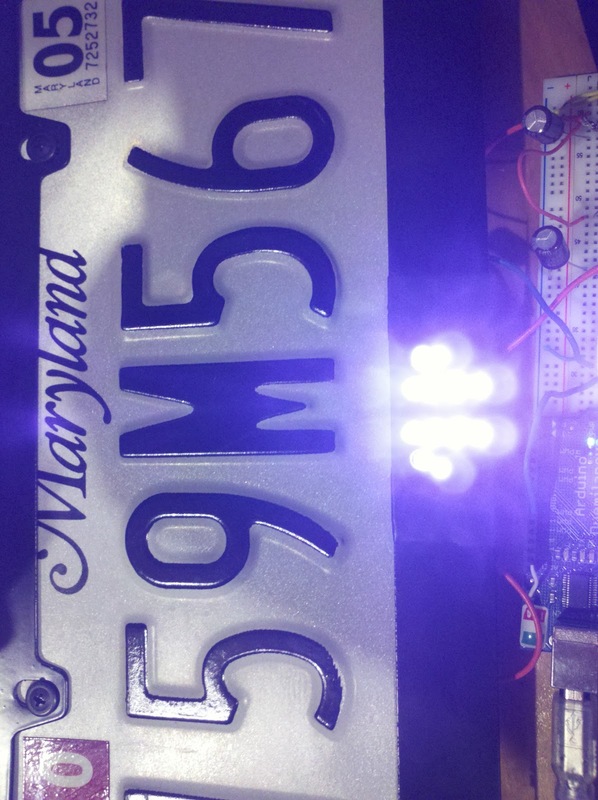 The clear LEDs were 50% brighter in my early tests, but I chickened out from using them. I went for cheap LEDs and simple circuits. Since then I've seen light up license plate frames for sale so I think the lights could be more obvious without attracting attention. So if you wanted you could buy one of these, already has the power connections, and replace the glowing eyes with 850nm high power LEDs. This is not my style, but if it is yours it is an easy way to beat the camera. 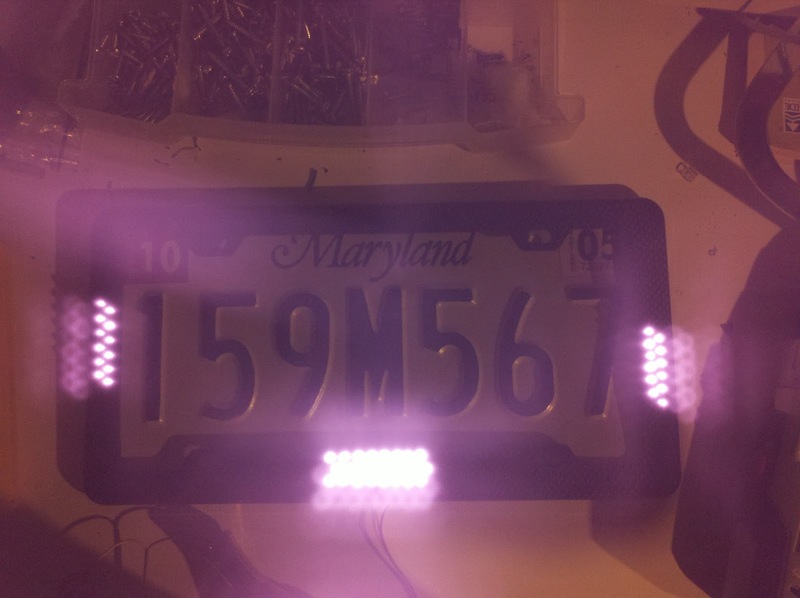 The 850nm LEDs would glow and look like it did before, and be totally undetectable. Not enough room for all the LEDs I'm using, but could give you a little help. A little googling found this too. 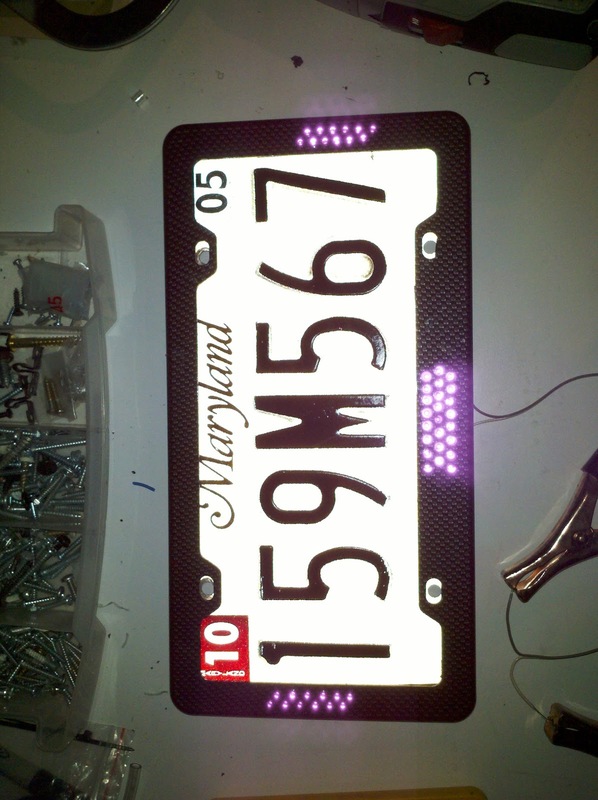 So this could serve as a starting point for a mod, replacing the LEDs with IRLEDs and keeping low profile. You could also get one of these, and ramp up the power. 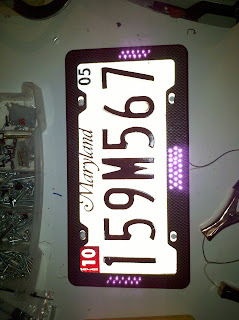 This alone has 140 LEDs, but I don't know what type so there is no way to know if you could achieve enough brightness. A place for my thoughts and links to computer monitors. I do tons of electronic graphical design both at work and at home. I'm a fan of lots of pixels on the screen, multiple monitors, etc. I feel it gives me more productivity to have my design, my blog, my datasheets, all in view at the same time. I also have a house full of teenage sons who do video gaming. Every time I get a new monitor I have to look up what my old one was so I can match sizes and swap things around. I recently bought a new monitor to replace a hulking CRT monster which was once a miracle of technology and wanted to jot down my thinking on this topic and record what monitors I have in one place. Circa summer 2011, 1900x1200 is king, and he is near death. 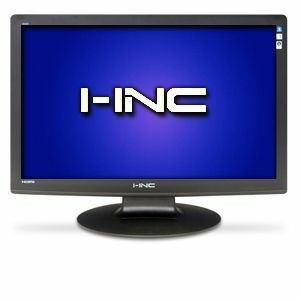 LCD, price and HDTV has ruined the computer monitor market. Since monitors have grown to the size of TVs, and the price for either is rock bottom, (you may not think it is rock bottom, but as a designer of consumer electronics, it barely pays to build and sell either) manufacturers have consolidated sizes. Lot of people watch TV and movies on their computer screens anyway, and the layman thinks 1080p is a big resolution. Lots of engineering applications expect 1900x1200, and those extra pixels above 1900x1080 make a big difference in having a usable workspace. 1900x1080 is like peering through a mail slot at your work. Taller is better for document reading too. So despite the price I still snap up 1900x1200 monitors when I find a good deal. Note I consider resolution over size any day. Larger than 1900x1200 are priced out of this world, >$1000. Not worth it. Used to be you could crank your CRT monitor up to 2560. It could get blurry but it still worked. Those days are over. That is why I hung onto my 23# widescreen CRT Sun monitor forever. But side by side, the 24 LCDs were brighter and crisper and I found my self sliding my window over to the LCD no matter what the resolution on the CRT was. So the CRT is now a boat anchor at the dump, and gave me a sore back on the way out. This think was HUGE and must have weighed 100 pounds. Somehow <$300 is a magic price point for me, so I troll for monitors 1900x1200 that are under $300. I've found the consumer quality monitors (aka el cheapo) are just fine. I've never had dead pixels, and getting a big monitor with lots of pixels does it for me. So i'm no snob for "professional" monitors that cost twice as much. Maybe viewing angle or evenness of display are better, but I've never noticed. It even has a promo code, which I missed, for another $20 off, and free shipping. I think it is being dumped because there is no HDMI port. It has displayport, which only HP laptops really support. 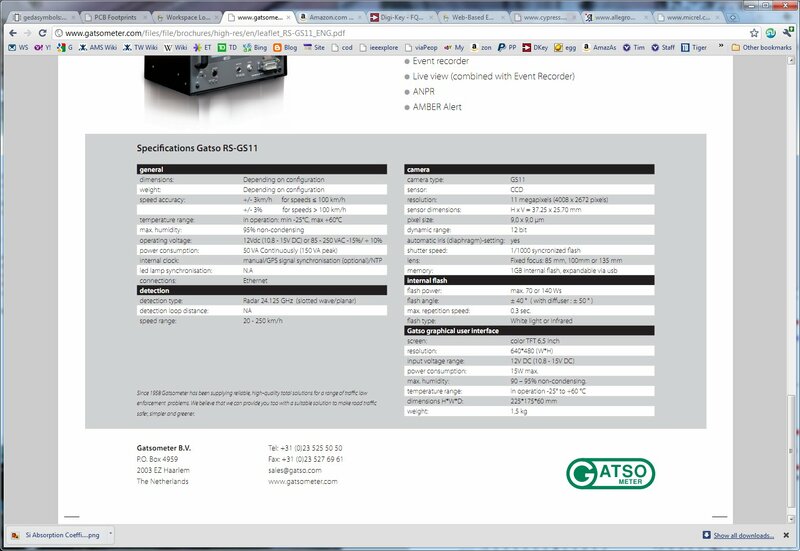 Has a DVI and VGA and looks good sourced by either. It is 1900x1200 and matches well with my older Sceptre monitor from 2008. It is for sale from Amazon, but is currently only from 3rd parties who charge shipping 24 LA2405wg LCD Monitor . It does seem that there are deals <$200 for 1900x1080 monitors, so this recomendation isn't for everyone. I got this monster 02/2011 from tigerdirect for $249!! Free shipping seems to come and go. Admittedly I had been looking for a 24", because that is about as big as my head and eyes comfortably take in when the monitor is a reasonable distance away. I had been searching on 1900x1200 and didn't notice this was bigger. It came in the mail and I thought there was a mistake and I'd bought a TV. Box and monitor are huge. It works great. It has two HDMI connectors and a DVI adapter. Not sure why they give it away. Picture was bright, sharp, uniform. Awesome. Almost bought another but they are so big, you have to have room for them. Two on your desk is probably too big for anyone. I got this one for my son's gaming in 2/2010 for $228. At the time it was the best deal on a 24" monitor that had an HDMI port so he could also hook it to his playstation as well as the computer. It has a DVI and a HDMI port both, so it could do double duty. His usage is purely entertainment. He does no engineering (how sad). It is only 1900x1080, and it cemented my opinion that 1900x1200 is worth paying for. It has a fast response time and has been a good monitor for him. He does notice that my 1900x1200's are taller, and comments on it a lot. However it was at least $50-100 cheaper than an equivalent 1900x1200. I got this one in 10/2008. It has been my workhorse all that time. It was $270 at the time, from Amazon, newegg, and tigerdirect, but is unavailable now. Had DVI and VGA inputs and speakers which I never used. I wrote a review when i got it, because with my old Thinkpad laptop extender, the display blinked out black once or twice an hour for a few seconds. Pretty annoying. After some reading on the web, I decided that it was the fault of low DVI signal levels. When I got a newer thinkpad and extender, the problem stopped. It is now hooked to a desktop machine and has never done this again.